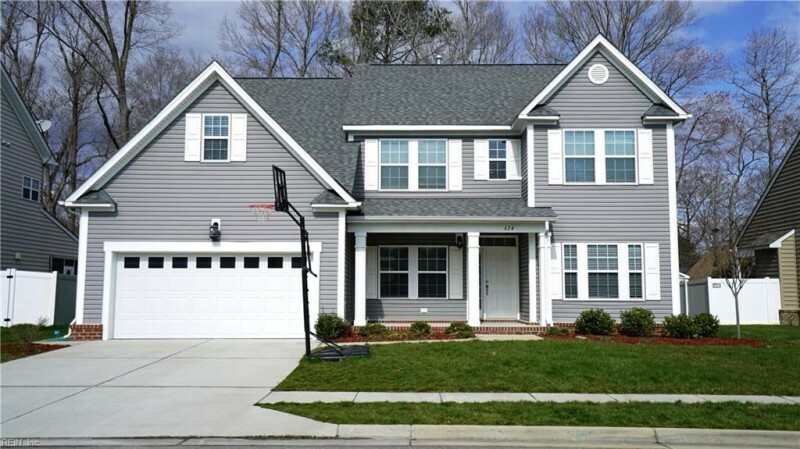 BEAUTIFUL HOME GREAT FOR ENTERTAINING WITH OPEN FLOOR PLAN, HARDWOOD FLOORS, STAINLESS APPLIANCES AND GRANITE COUNTERTOPS IN THE MUCH SOUGHT AFTER GREAT BRIDGE SCHOOL SYSTEM! PLAYGROUND EQUIPMENT CONVEYS AS DOES EXTRA REFRIGERATOR IN SCREENED PORCH. THE MAIN FLOOR INCLUDES A GUEST SUITE, LIVING ROOM OR OFFICE, HUGE KITCHEN, FORMAL DINING ROOM, AND A FAMILY ROOM WITH GAS FIREPLACE! WONDERFUL RELAXING SPACE IN REAR SCREENED PORCH. SECOND FLOOR INCLUDES 4 BEDROOMS, LAUNDRY ROOM, AND A LARGE MEDIA ROOM. MASTER BEDROOM HAS CATHEDRAL CEILINGS WITH AN ENORMOUS WALK IN CLOSET. MASTER BATH HAS JETTED TUB, MARBLE COUNTERTOPS WITH A DOUBLE SINK. IRRIGATION SYSTEM IN FRONT AND REAR OF LOT. A MUST SEE! Ready to visit 624 William Hall? Request a free property tour! Send me more information about the listing at 624 William Hall, Chesapeake, VA 23322, MLS# 10183067. This 5 bedroom, 3 bathroom home located at 624 William Hall, Chesapeake, VA 23322 has approximately 3,352 square feet. It is currently listed for $415,000 and has a price per sqft of $12,381. This home is currently Sold under the MLS#: 10183067. This listing is provided by Howard Hanna William E. Wood. 624 William Hall Way, Chesapeake was built in 2013. It has Garage Att 2 Car, 2 Space parking.The kitchen includes Dishwasher, Disposal, Dryer Hookup, Gas Range, Refrigerator, Washer Hookup. 624 William Hall is part of the Jordan Hall @ Johnstown neighborhood located in 23322.